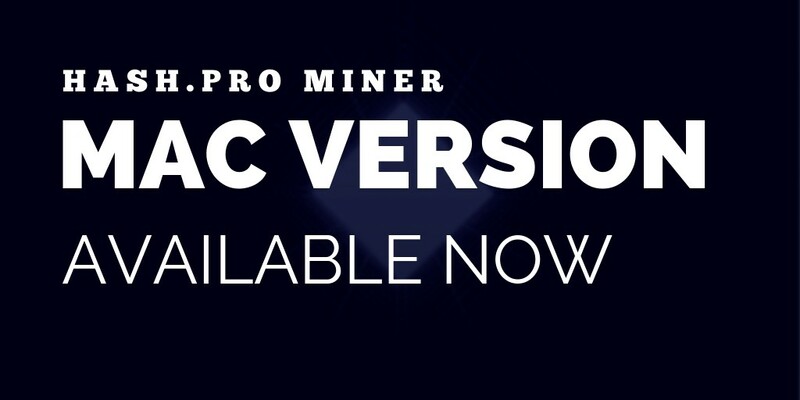 Today we are excited to announce the launch of our Mac Version for the Hash.Pro Miner, now you can mine bitcoin on your Mac. This new version is now showing a better compatibility with your Mac. With the Hash.Pro Miner account, you can track your device’s status, use mining calculator to estimate your earning, withdraw your earned bitcoins, as well as buy our cloud mining contract. The essential feature of Hash.Pro Miner is its dynamic algorithm change, the system will automatically switch algorithm to mine the most profitable coins to maximize miners’ profits. All you need is a Mac and stable internet connection, you can download the app for Mac HERE. You can contact us via our Telegram channel or leave a message to support@hash.pro.